Most experts in our field will agree that if we really want to transform the world to sustainability, we must be ambitious, build on our strengths, integrate sustainability & CSR into the DNA of the organization, and think systemically – placing ‘effectiveness’ before ‘efficiency’. What makes us different from our competitors, is that we’ve put this into practice. It was little more than two years ago when, after extensive research, we concluded that mainstream reporting standards appeared to lack local relevance and support in the Islamic community. Understanding the transcending nature of Islamic corporate culture and its compatibility with Sustainability & CSR, EMG sought to develop a framework that would capture and capitalize on these elements. Together with our partners, we thus led the creation of the world’s first reporting framework for Sustainability & CSR based on Islamic values – the Islamic Reporting Initiative (IRI) – as part of EMG’s own contribution to Sustainability & CSR. Positively, our traditional competitors are now our best allies! The IRI is an independent not-for-profit organization leading the creation of the world’s first reporting standard for sustainability and CSR – across all business sectors – based on Islamic values and principles. By making sustainability and CSR culturally relevant, the IRI aspires to effectively accelerate the uptake of sustainability and CSR and systemically advance the implementation of the SDGs through nearly a quarter of the world’s population with custodianship for vast reserves of natural resources. EMG provided the initial funding of EUR 230,000 (no related party transactions). Office space was provided through an in-kind contribution by EMG valued at EUR 25,000 for the period 2015-2016. EMG Founder Drs Daan Elffers has performed all IRI-related duties pro-bono. 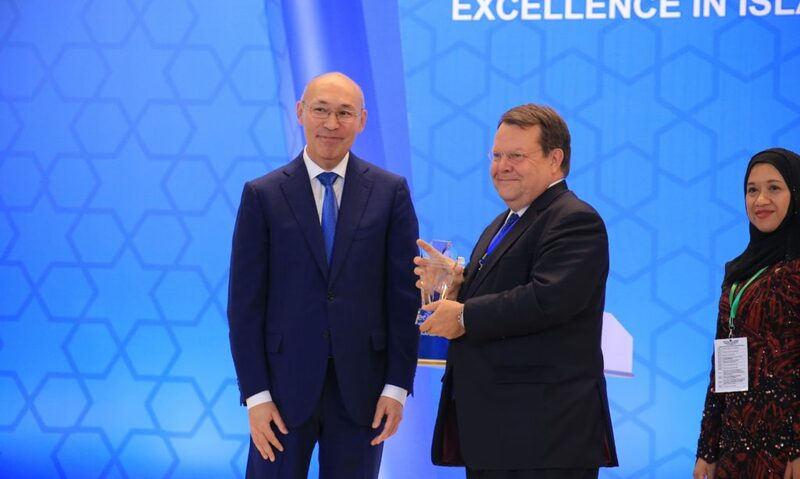 IRI wins International Excellence Award at the annual GIFA ceremony – this year held in Astana – attended by Kazakhstan President Nursultan Nazarbayev. The award was received on behalf of the IRI by Dutch Ambassador Dirk Jan Kop. The IRI Board of Trustees is chaired by Mr Mohamed Amersi. Mr Amersi is engaged in a full sphere of activities ranging from for profit, responsible profit and non-profit. He is an active philanthropist and social conscience leader sitting on numerous Boards and Advisory Councils, including those of the Royal Agricultural University and the Prince’s Trust International. We have been astounded by and are immensely grateful for the overwhelming support this initiative has received from people all over the world in such a short time. With the active involvement and support of our members and partners in more than 50 countries, we are confident that the IRI is ready to progress to the next level. Our vision is ambitious, as are our goals and expectations. However, the challenges that face our society and our environment demand ambition. We have faith in human values and in the ability of the Islamic community to collaborate in promoting the values at its core. We invite all EMG’s partners and constituents – from all countries in the world – to learn more about the IRI on www.islamicreporting.org, and hope that you will be able to participate in some way in this momentous journey.